Poland – As the commemoration of the 72nd anniversary of the liberation of the Auschwitz-Birkenau camp was taking place, and while some media were still using the expression “Polish concentration camps” to designate the former German camps built on Polish territory, the former President of the Knesset, former ambassador of Israel to Warsaw and chairman of the Yad Vashem Memorial Council Szewach Weiss, an Israeli who was born in Poland and saved by Ukrainians and Poles, published on January 23, in the conservative magazine Do Rzeczy where he has a weekly column, a text to evoke Poland from his childhood and today’s. 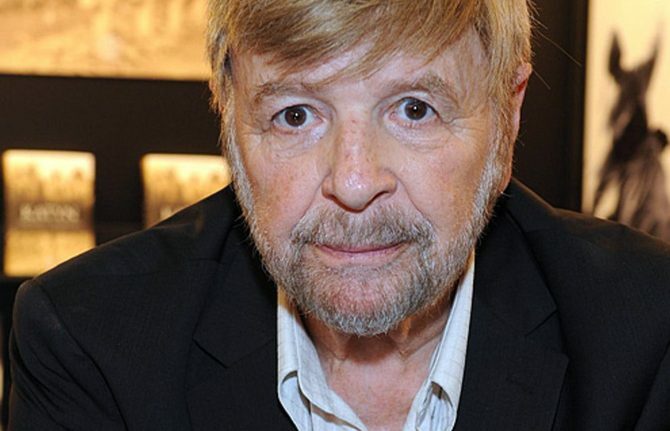 Szewach Weiss has always been a virulent critic of those, including Jewish circles around the world, who want to give the Poles part of the responsibility for the Holocaust. On January 17, Polish President Andrzej Duda gave him the oldest and highest Polish decoration, the Order of the White Eagle. Poland was for me a natural choice when, after my years in the Knesset, including some as its president, I began my work as ambassador. I chose to be appointed to Poland. It was a return to my Poland, or, to be more exact, to my Polands. One of them is the Poland of my childhood, which never disappeared from my memory and comes back to me in my dreams. It was a very interesting, sometimes very joyful Poland, and sometimes – when I think, for example, about the murder of my grandparents – very sad and very tragic. It was Galician Poland, a plurilingual, multicultural, and very interesting for older people, but also exciting for children. When I was a child, Boryslav, where I was born, had about 50,000 inhabitants, including perhaps 20,000 Poles, 15,000 Ukrainians and 15,000 Jews. It was therefore a true mixture of cultures, languages ​​and religions typical of Galicia. In kindergarten, where there were a lot of Jewish children, we learned songs in Polish and Ukrainian, and there were times when the nurse or another Jewish person taught us Jewish songs in Yiddish. In those days, I still remember the song [always popular with Polish children, Ed. ]: “A Cracovian boy had seven little horses, he went to war, there was only one left . He waged seven years, never slipped out his saber, his sword rusted, he did not see war.” I recalled to the lyrics of this songs long afterwards, when Poland bought Spike missiles from Israel. I said then that I wished to Poland that this “saber”, that is to say the missiles, will rust and never see the war. Yes, the Poland of my childhood still lives in me. The clouds in the sky of Poland have always made a great impression on me. When they are black, they remind me of the darkness of the places where the righteous among the nations hid us. I remember the double walls of our little house that allowed us to find refuge and survive. When I travel to Poland and see a countryside chapel, it always reminds me of the chapel in which our family was hidden by the Góral family. I remember of squirrels coming in. I then said to my mother: “Too bad I was not born a squirrel. I would be free and there would be no need to stay locked up here.” But when we were cloistered like this, every one of us was aware of all that the family who had put us there made for us [in occupied Poland, hiding Jews was liable to execution for all members of the family, Ed.]. My Poland is also the Polish youth. I entered politics after going through the world of teaching. I have the honor, and I emphasize that it is an honor for me to come regularly to Poland to give courses. The youth I meet, and to whom I give these courses, is my hope. It is a generation that is faced with great goals and great challenges related to the message: “Never again!”. I feel that these young people have sympathy for my people and that they also have great compassion for this great injustice and terrible extermination that the Jews suffered on Polish soil during the German occupation. The media is also important for my presence in Poland. Almost at the very beginning of my ambassador’s mission, I met Piotr Gabryel [who is currently the deputy editor-in-chief of the weekly Do Rzeczy] and to this day I am also present in the print titles where he appears. We are now together in Do Rzeczy, and I am impressed by the intellectual level of my friend Paweł Lisicki’s weekly magazine [the editor-in-chief of Do Reczy]. I am sometimes asked why, when I am linked to Social Democracy, I publish in right-wing, conservative press titles. This is primarily because of my friendship, but I have never been censured. The Order of the White Eagle is in a way a synthesis of my links with Poland, and it is for me a particularly important decoration. I am moved and proud. It was given to me in a concrete context, that of my personal mission as an ambassador of Israel to Poland, as a man born in Poland, a child of the Holocaust, saved at Boryslav by Righteous among the Nations. Each ambassador tried to restore the injured relations between Poles and Jews. After the war, we ran out of time to conduct a dialogue. Since 1989 when Poland has once again become a parliamentary democracy, her relations with Israel are doing very well. We treat these relationships on the basis of memory, the whole truth about what has been good, but also bad, always remembering the Righteous among the nations that are my particular heroes, the heroes of the Jewish people, and who became the heroes of the whole moral world. This decoration that I received in Jerusalem from the hands of President Andrzej Duda is not a political prize, it does not come from the right or from the left. We lived so many years side by side, and then almost everything ended in six years during the German occupation. Now, on the ruins of the past, we try to renew these relationships so that future generations can remember that the Jewish people flourished for many years on Polish lands. And also that, unfortunately, there was agonized because of that frightful fascism of which the Jews and Poles were the victims. 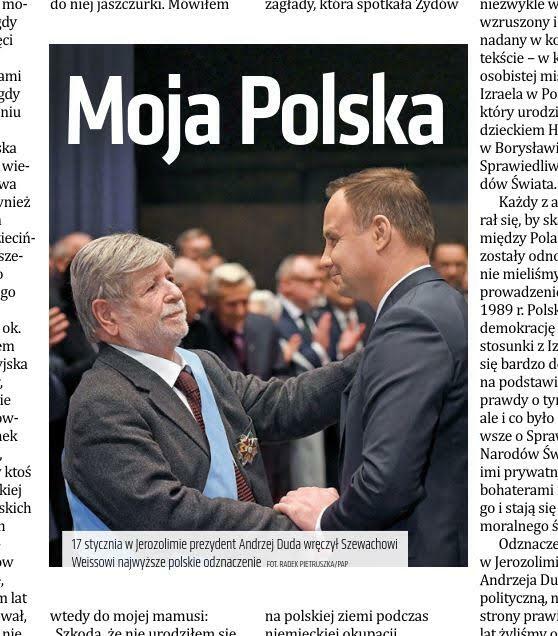 Screenshot of Szewach (Shevah) Weiss’ column in the Do Rzeczy of January 23, 2017, published under the title “Moja Polska” (My Poland). Pictured: Szewach Weiss in Jerusalem awarded with the Order of the White Eagle by Polish President Andrzej Duda. My late grand-mother, Pelagia Iwaniuk, in Bialystok, Poland, during the Second World War hid a Polish-Jewish young man despite the fact that she had two little children whose lives would be “jeopardised” (to use an euphemism) as well as hers, should the Germans find out about this fact. After the war, the young man thanked her. My Catholic Polish Father’s family sheltered a Jewish family in the early part of WW2. Unfortunately the family were later apprehended by the Germans and revealed the identity and whereabouts of Those who had helped them. The Germans subsequently seized my Grandfather and 2 of my uncles, who all ended up in Auschwitz. None of them survived. Poland was occupied country and if and when some Polish people collaborated with the Germans – this was done not by Poland as a country.